Hope you weren’t looking forward to a night of sleep untroubled by nightmares. Doing his part to make sure Lovecraftian mechanized horrors have lease in your subconscious, [Paul-Louis Ageneau] has recently unleashed the horror that is Eyepot upon an unsuspecting world. This Cycloptic four legged robotic teapot takes inspiration from an enemy in the game Alice: Madness Returns, and seems to exist for no reason other than to creep people out. Even if you aren’t physically manifesting nightmares, there’s plenty to learn from this project. [Paul-Louis Ageneau] has done a fantastic job of documenting the build, from the OpenSCAD-designed 3D printed components to the Raspberry Pi Zero and Arduino Pro Mini combo that control the eight servos in the legs. If you want to play along at home all the information and code is here, though feel free to skip the whole teapot with an eyeball thing. A second post explains how the code is written for both the Arduino and Pi, making for some very illuminating reading. A Python script on the Pi breaks down the kinematics and passes on the appropriate servo angles to the Arduino over a serial link. Combined with a web interface for control and a stream from the teapot’s Raspberry Pi Camera module, and you’ve got the makings of the world’s creepiest telepresence robot. We’d love to see this one stomping up and down a boardroom table. Seems we are on a roll recently with creepy robot pals. Seeing a collaboration between Eyepot and JARVIS might be too much for us to handle. Though we have a pretty good idea how we’d want to control them. What we like most about [GreatScott’s] project videos is that he not only shows making them but also the calculations for selecting parts and the modifications along the way. This time he’s made a mini spy bug that records up to nine hours of audio. His first task was to figure out if the ATmega328p’s ADC is suitable for audio sampling, but only after he explains how sampling works by periodically checking the input voltage from the microphone. Checking the datasheet he found that the ADC’s fastest conversion time is 13 microseconds, which works out to a sampling rate of 76.923 kHz. Good enough. He then walks through why and how he decided to go with a pre-made amplifier circuit built around the MAX9814 IC. Spoiler alert. His electret’s amplifier output voltage was too low, using an off-the-shelf circuit instead of making his own kept things simple, and the circuit has automatic gain control. At this point, he added the MicroSD card adapter. Why not just transmit the audio over FM as so many others have done with their hacks? Perhaps he’s worried about someone detecting the transmission and finding his bug. His final optimization involved getting a good battery life. He measured the circuit’s current draw at 20 milliamps. With a 160 mAh battery capacity, that would be 8 hours of recording time. Removing the Arduino Pro Mini’s voltage regulator and two LEDs got the current down to 18 milliamps and a recording time of 9 hours. Better. Those are the highlights. Enjoy his full walkthrough in the video below. [William Osman] set out to prove that unlike expensive commercial data logging rigs, he could get the same results for under twenty bucks. He wanted to build a wireless three-axis accelerometer for a race car project, allowing engineers to make modifications to the suspension based on the data collected. 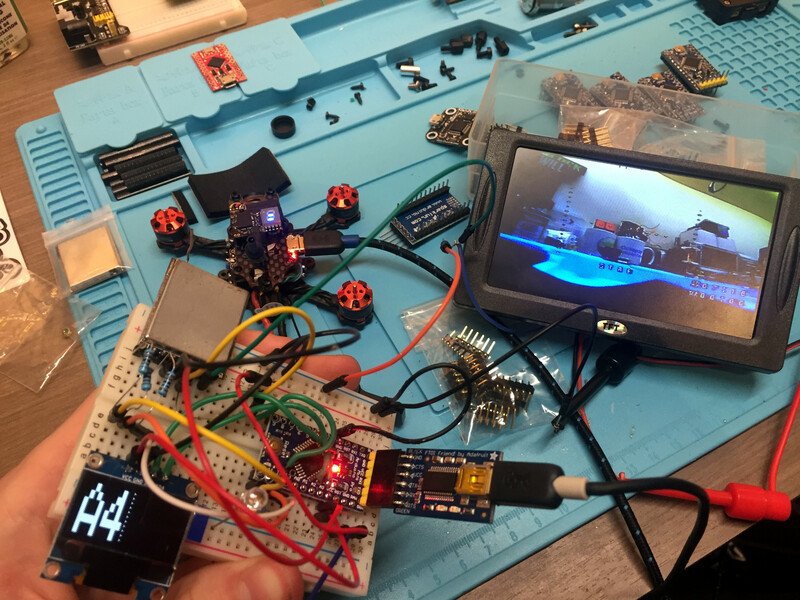 The hardware consists of an Arduino Pro Mini connected to a three-axis accelerometer, and an nRF24L01 wireless module. Power is supplied by the race car’s 12 V, changed to 5 V by a linear regulator with the Pro Mini in turn supplying 3.3 V. The base station consists of an Arduino and another nRF24L01 module plugged into a laptop. The telemetry system is based on COSMOS, an open-source, realtime datalogging platform put out by Bell Aerospace. COSMOS consists of fifteen separate applications depending on how you want to view and manage your telemetry. You can download [William]’s COSMOS config files and Arduino sketch on Google Docs. We’ve published a bunch of pieces on telemetry, like this ESP8266 telemetry project, a rocket telemetry rig, and open sourcing satellite telemetry. The World Health Organization estimates that around 90% of the 285 million or so visually impaired people worldwide live in low-income situations with little or no access to assistive technology. For his Hackaday Prize entry, [Tiendo] has created a simple and easily reproducible way-finding device for people with reduced vision: a bracelet that detects nearby objects and alerts the wearer to them. It does its job using an ultrasonic distance sensor and an Arduino Pro Mini. The bracelet has two feedback modes: audio and haptic. In audio mode, the bracelet will begin to beep when an object is within 2.5 meters. And it behaves the way you’d expect—get closer to the object and the beeping increases; back away and it decreases. Haptic mode involves two tiny vibrating disk motors attached to small PVC cuffs that fit on the thumb and pinky. These motors will buzz differently based on the person’s proximity to a given object. If an object is 1 to 2.5 meters away, the pinky motor will vibrate. Closer than that, and it switches over to the thumb motor. To add to the thriftiness of this project, [Tiendo] re-used other objects where he could. The base of the bracelet is a cuff made from PVC. The nylon chin strap and plastic buckle from a broken bike helmet make it adjustable to fit any wrist. To keep the PVC cuff from chafing, he slipped small pieces from an old pair of socks on to the sides.